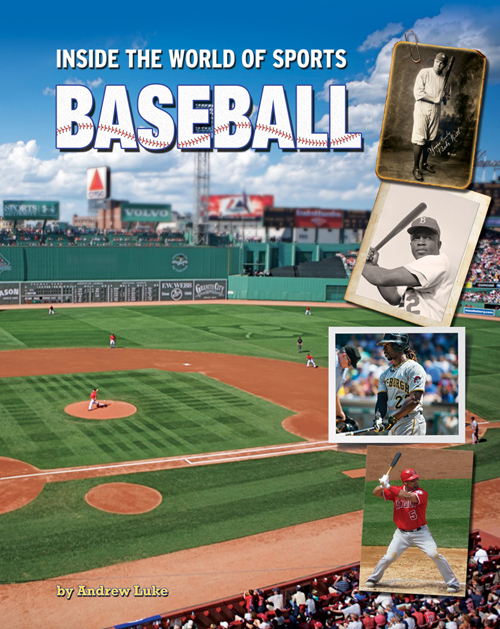 Inside the World of Sports gives readers a behind-the-scenes look at the development and progression of 13 major sports. 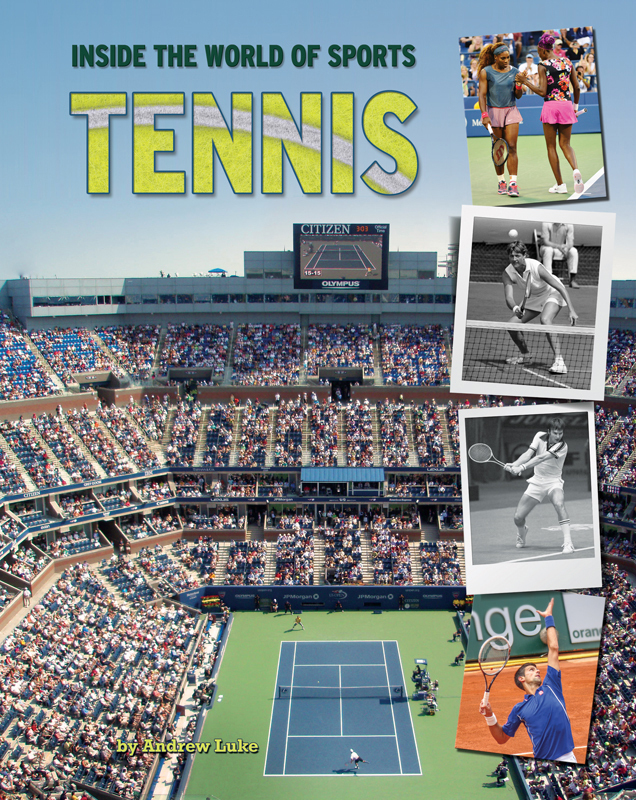 Take a look back in history at the origins and evolution of these sports, read about the modern day stars, the up-and-coming athletes, and predictions for future changes to each sport. Engulf yourself into the discussion of how fans truly gauge greatness as authors compare some of the sport’s top athletes from its inception to today. Unique to this Mason Crest series is a new editorial addition for today’s tech savvy teen. Not only can you read about the greatest moments of all time at the beginning of each volume, but every book includes QR codes which, once scanned with a smart phone, allow readers to view videos of these iconic moments. 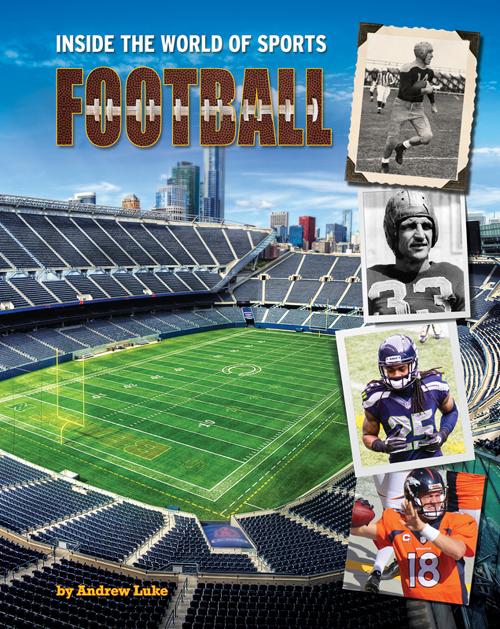 From yesterday… to today… to tomorrow… jump Inside the World of Sports! From the time cars were invented just before the turn of the 20th century, men have loved driving fast in them. It was almost a compulsion of pioneers like Emile Levassor and Karl Benz to make their machines go fast. Racing fever began in Europe, with races happening from point to point, city to city, on existing roads. Open-wheel road racing there evolved into the super high tech, big budget sport of Formula One racing. American open-wheel racing matured on oval tracks, most famously the one at the Brickyard in Indianapolis, home to the world’s most famous auto race, the Indianapolis 500, the crown jewel of the IndyCar circuit. Racing also took on a distinctly American form, with stock car racing evolving into one of the most popular spectator sports in the country, with NASCAR as its multi-billion dollar brand. Each book in the Inside the World of Sports series takes you from the very beginning of a sport to a look at its future. 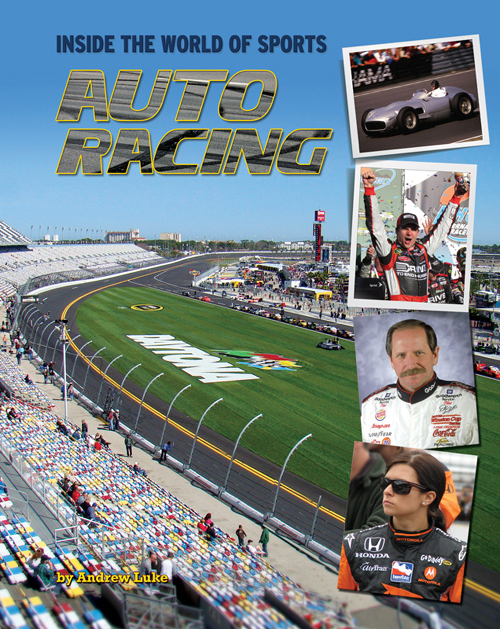 Inside these pages, learn more about auto racing’s greatest moments, iconic athletes, and what the future holds for racing. Baseball is known as America’s national pastime, but its popularity did not happen overnight. The modern game evolved in the late 1800s in the Midwest, and by the turn of the century, Americans were telling stories about heroic exploits on the baseball diamond. Players from Ty Cobb and Babe Ruth to Andrew McCutchen and Albert Pujols have thrilled fans with dramatic late-inning plays and thrilling World Series winning hits. The constant simplicity of baseball over more than a century is a large part of its appeal. More than 70 million people go to the ballpark every season to watch the game unfold during a leisurely summer afternoon or under the stars on a crisp September evening. Although the game has taken root in places like Japan and Latin America, baseball is still a uniquely American experience. Each book in the Inside the World of Sports series takes you from the very beginning of a sport to a look at its future. Inside these pages, learn more about baseball’s greatest moments, iconic athletes, and what the future holds for the game. No major sport is as uniquely American as basketball. The sport has come a long way since students at a Massachusetts YMCA started throwing balls into peach baskets nailed to the wall. Today, some of the world’s most spectacular athletes soar through the air in feats of athleticism on the basketball court. With the advent of the shot clock and the three pointer, the game became more exciting over the years. The NCAA Men’s Basketball Tournament is one of the most popular sporting events in the United States, and the NCAA superstars go on to thrill NBA audiences as professionals. Kids play basketball across the country, from urban playgrounds in New York and L.A. to the gyms of Chicago and dusty farmland courts in Indiana. All that is needed is a ball, a hoop, and a dream. Each book in the Inside the World of Sports series takes you from the very beginning of a sport to a look at its future. 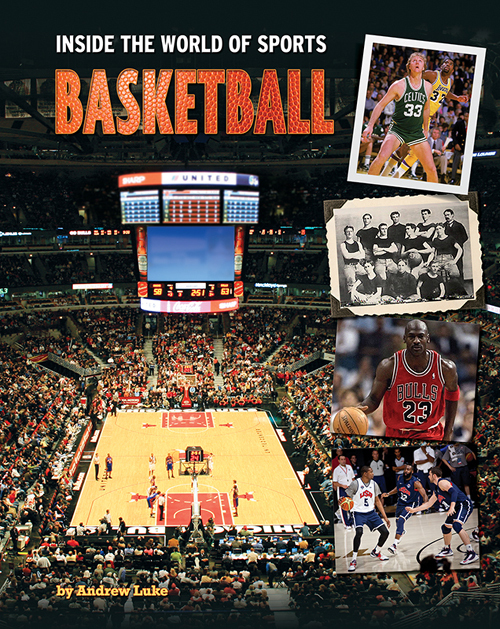 Inside these pages, learn more about basketball’s greatest moments, iconic athletes, and what the future holds for the game. Jump off a cliff. Slide down a mountain. Soar 20 feet above a snowy halfpipe. These are just a few of the things extreme sport athletes willingly do every day, things the average person would never consider attempting. 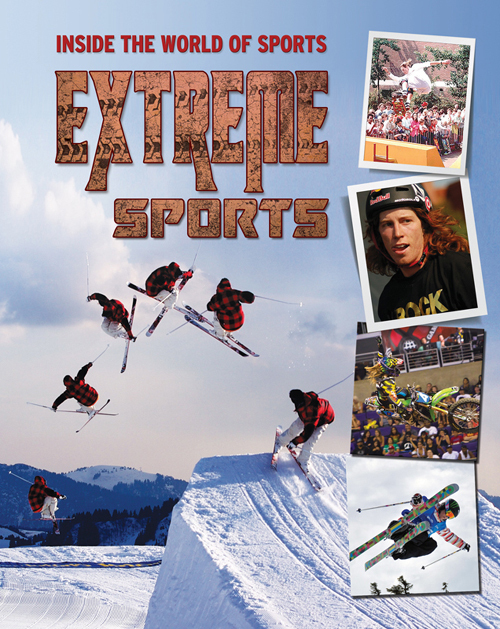 With the overwhelming success of sports network ESPN’s X Games, the subculture of extreme sports became mainstream, even becoming part of the Olympic Games. American snowboarder Shaun White became not just one of the most popular extreme athletes, but one of the most popular athletes of any kind in the world when he won the gold medal in the halfpipe event at the 2006 Winter Olympics. From Snowboard Big Air to BMX Vert, and Moto X to Ski Slopestyle, extreme sports have changed the language and culture of mainstream athletics. The slacker image is gone…these athletes are the real thing. 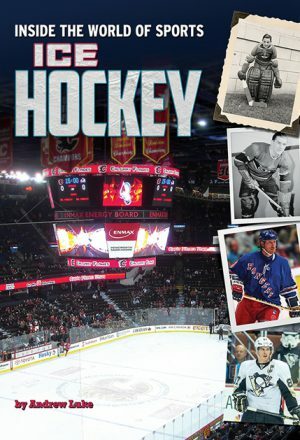 Each book in the Inside the World of Sports series takes you from the very beginning of a sport to a look at its future. Inside these pages, learn more about extreme sports’ greatest moments, iconic athletes, and what the future holds for the games. The 1958 NFL Championship game is known as “The Greatest Game Ever Played”, and the nationally televised overtime thriller had the country buzzing about NFL football for the first time, launching the sport into the stratosphere. College football had been the version of choice when it came to football but after 1958, however, stars like Jim Brown and Joe Namath took advantage of the sport’s newfound exposure to make watching NFL football appointment television every Sunday. Iconic franchises rose to prominence, like the Packers in the 1960s, the Steelers in the 1970s, the 49ers in the 1980s and the Cowboys in the 1990s. Today, NFL football is the most popular sport in America, and its signature championship, the Super Bowl, is the most watched event in the country, and one of the most watched in the world. Each book in the Inside the World of Sports series takes you from the very beginning of a sport to a look at its future. Inside these pages, learn more about football’s greatest moments, iconic athletes, and what the future holds for the game. The game of golf originated, grew and thrived in 18th and 19th century Scotland. Wooden clubs were used to hit wooden balls across the natural dunes and valleys of the Scottish coastline. The game spread across to the United States in the late 1800s. 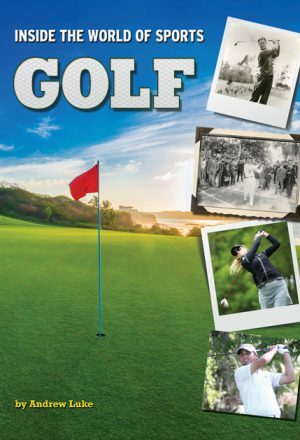 Some of the game’s greatest players come from America, from Bobby Jones, Jack Nicklaus, and Tiger Woods to Patty Berg, Kathy Whitworth, and Nancy Lopez. The rest of the world caught up quickly, however, producing legends like South African Gary Player and Australian Greg Norman on the men’s side, and female stars like Sweden’s Annika Sörenstam and Australia’s Karrie Webb. Today, a new generation of players from Jordan Spieth to Inbee Park is leading the way into the future. Golf faces its challenges in modern day America, as it booms in places like Asia. Each book in the Inside the World of Sports series takes you from the very beginning of a sport to a look at its future. 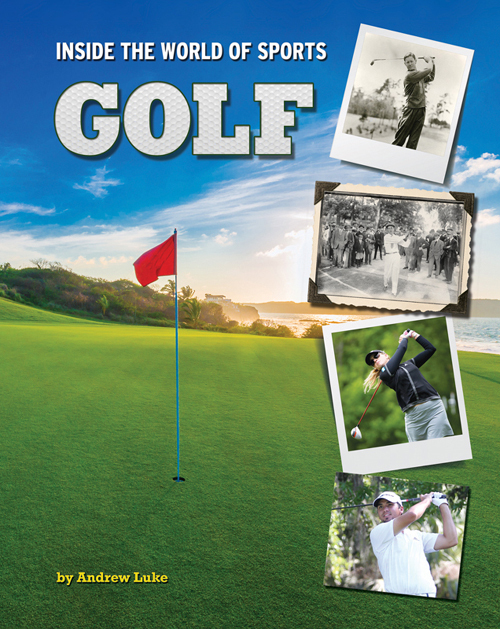 Inside these pages, learn more about golf’s greatest moments, iconic athletes, and what the future holds for the game. Once a discipline for training soldiers for combat, gymnastics has evolved into a sport that emphasizes not only strength but also artistry and grace as well. Modern gymnasts compete with the lofty goal of someday making it to the Summer Olympic Games, where gymnastics are one of the most popular events. Athletes from countries like Russia, Romania and Japan dominated the sport through most of the 20th century, with stars like Olga Korbut, Nadia Comaneci, Vitaly Scherbo and Kōhei Uchimura. American stars have emerged more recently, following the triumph of Mary Lou Retton at the 1984 Olympics in Los Angeles. Since, athletes like Paul Hamm, Shannon Miller, Carly Patterson and Gabby Douglas have followed in her footsteps. Fans continue to be drawn to the incredible strength, agility and grace of these athletes. Each book in the Inside the World of Sports series takes you from the very beginning of a sport to a look at its future. 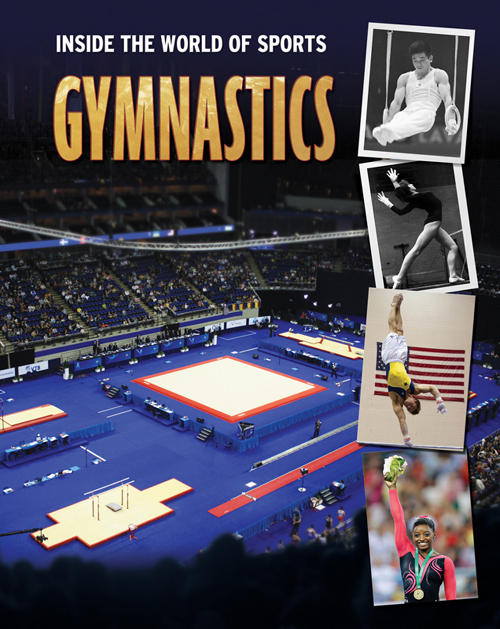 Inside these pages, learn more about gymnastics’ greatest moments, iconic athletes, and what the future holds for the sport. Ice hockey is Canada’s game. The modern version was crafted in Montréal, and it spread across the country on frozen ponds and lakes. Most of the game’s greatest players are Canadians, but even in the early days of the sports, the American influence was felt. Hobey Baker was the first great American player. He was captain of the Princeton hockey team and led his amateur team to a national championship. Baker never played the pro game, however, choosing to serve his country in World War I instead. NHL players compete for the Stanley Cup, the oldest professional sports trophy in North America. Today, 23 of the NHL’s 30 teams are U.S. based, and American stars like Zach Parise and international stars like Henrik Lundqvist share the spotlight with stars from Canada like Sidney Crosby. Each book in the Inside the World of Sports series takes you from the very beginning of a sport to a look at its future. 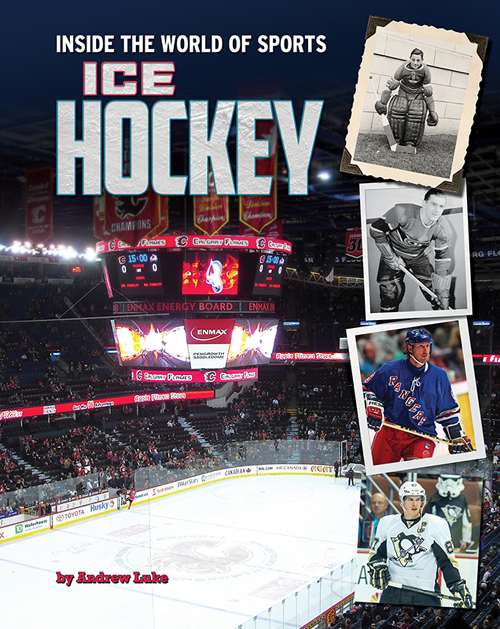 Inside these pages, learn more about ice hockey’s greatest moments, iconic athletes, and what the future holds for the game. An ancient sport of an ancient people, lacrosse has been played in North America for centuries. Part of the ritual of their lives and cultures, lacrosse was a sport practiced more so than played by the native people of eastern Canada and the North Eastern United States. European settlers were fascinated by the game, and over the centuries, it evolved to the sport with modern rules and modern equipment that is played in high schools and colleges across North America today. Lacrosse is played predominantly in the colleges of the northeast, but this is changing as its popularity grows and the game spreads. The University of Denver Pioneers was the first team outside of the Eastern Time zone to win the men’s Division I championship in 2015. 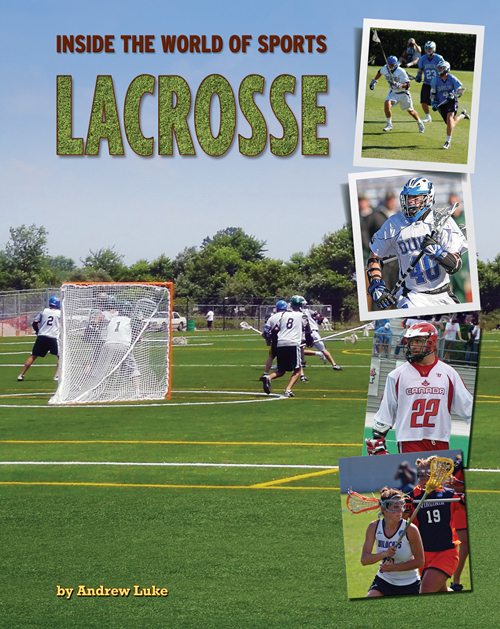 Lacrosse is also a popular women’s sport, with more than 100 sanctioned Division I programs. Each book in the Inside the World of Sports series takes you from the very beginning of a sport to a look at its future. Inside these pages, learn more about lacrosse’s greatest moments, iconic athletes, and what the future holds for the game. Around the world, soccer is known as “the beautiful game.” It is the biggest and most popular sport on the planet, and its signature event, the World Cup, is the most watched televised event, even more than the Olympics or the Super Bowl. The sport can be found almost everywhere in the world. From children on the playgrounds of modern cities to those in the remote fields of developing countries, the love of the simple act of kicking the ball back and forth has spanned generations. As a professional sport, soccer has exploded in Europe and South America, where the top athletes are among the highest paid in the world. In the U.S., soccer is much less popular, but Major League Soccer has become America’s first successful professional league, where homegrown stars have the chance to shine. 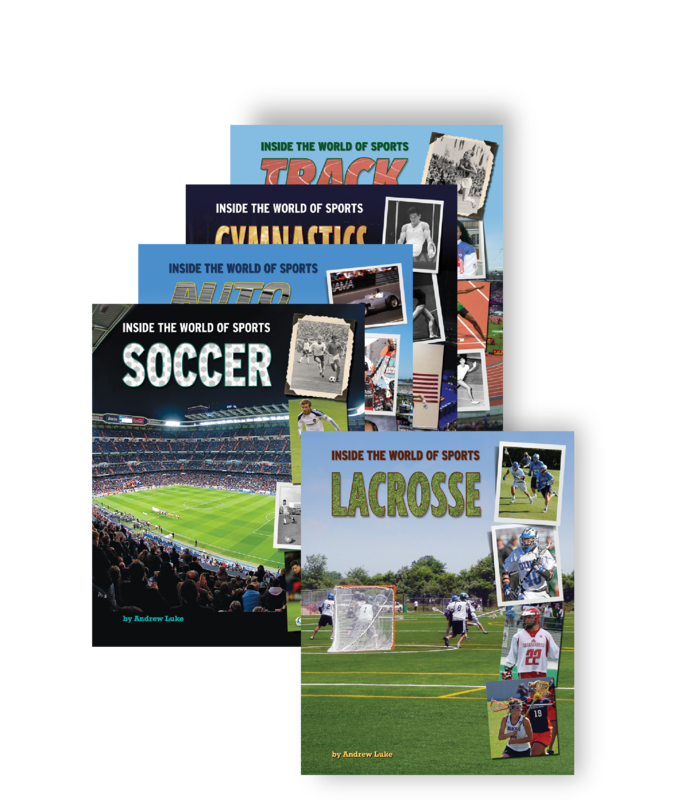 Each book in the Inside the World of Sports series takes you from the very beginning of a sport to a look at its future. 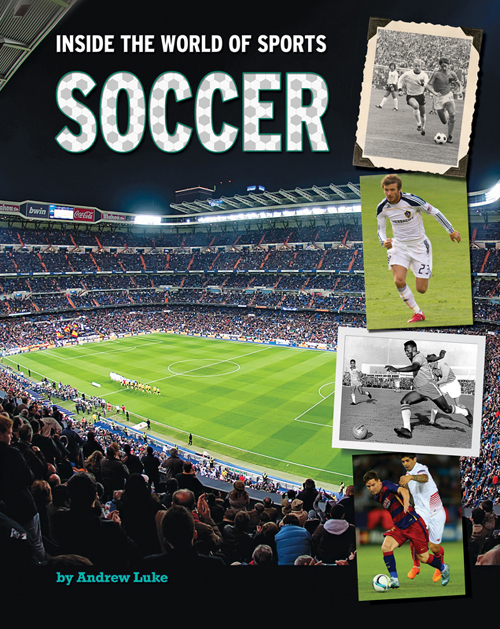 Inside these pages, learn more about soccer’s greatest moments, iconic athletes, and what the future holds for the game. World’s Fastest Human. That is the title bestowed on the man with the best time in the 100 meter dash. This event is the centerpiece of track and field, the collective name for events that are based on running, jumping and throwing. Who is the fastest? Who can jump the highest? Who can throw the farthest? These are the questions men have been challenging each other to answer for centuries. The World’s Fastest Human was Jamaica’s Usain Bolt in 2015, but for nearly 100 years, women have taken up the challenge as well. 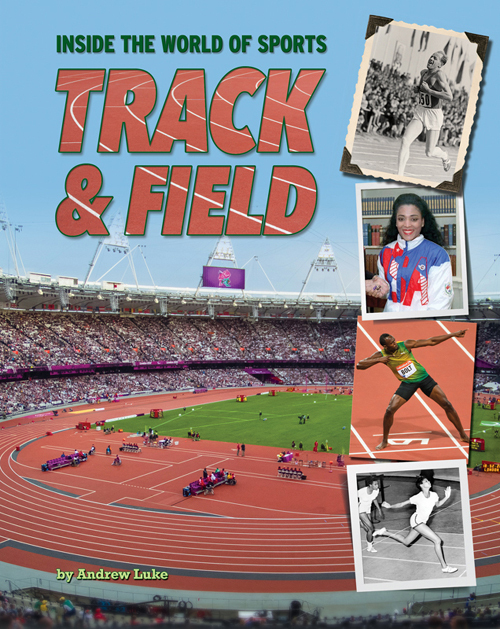 Female stars like Jackie Joyner-Kersee and Yelena Isinbayeva have inspired little girls to dream of running faster and jumping higher over the decades. Those girls have grown into the stars of today, like Alyson Felix, Genzebe Dibaba and Barbora Špotáková. 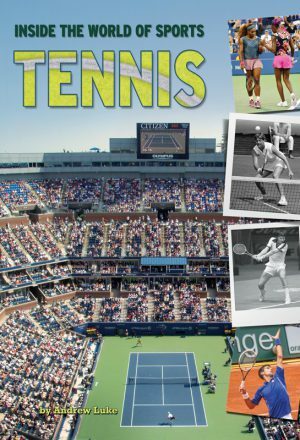 Each book in the Inside the World of Sports series takes you from the very beginning of a sport to a look at its future. 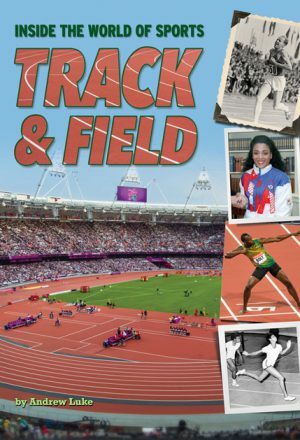 Inside these pages, learn more about track and field’s greatest moments, iconic athletes, and what the future holds for the sport. The sport of wrestling is quite possibly the oldest athletic pursuit of humankind. It has been depicted or described in one form or another for thousands of years and was especially celebrated by the ancient Greeks at the original Olympiads. 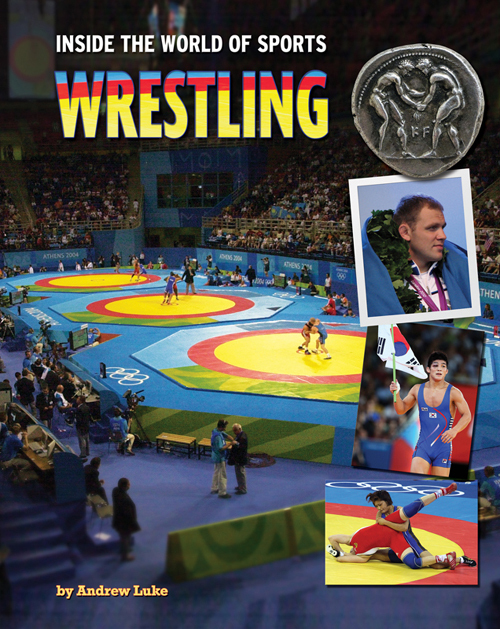 In modern times, wrestling has been a part of every Olympic Games since they were revived in 1896. The sport developed two distinct styles: Greco-Roman and Freestyle, both of which are featured prominently on the international stage. In the United States, the sport took on a slightly different style, and high school and college athletes pursue that Folkstyle variation across the country. These athletes are not only boys anymore. Girl’s wrestling has grown in popularity in recent years, with more than 11,000 female athletes competing at the high school level. Women now also compete at the World championships and the Olympics. 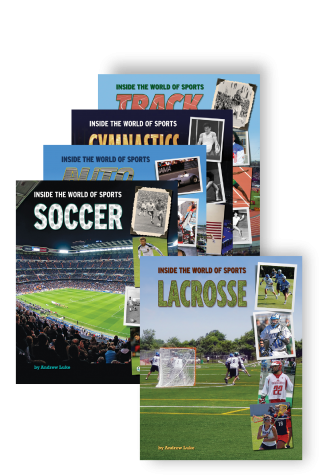 Each book in the Inside the World of Sports series takes you from the very beginning of a sport to a look at its future. Inside these pages, learn more about wrestling’s greatest moments, iconic athletes, and what the future holds for the sport.